Happy Birthday to the Songstress from Cohutta, Miss Mallary Hope! Here at the Swift Agency, still a guy that will always have a soft spot for the Hopester, we’re celebrating Miss Mallary Hope’s Birthday with cake! Okey, we had cake… It’s gone. It’s those darn ninjas I tell you. We were hoping to get some cool clips from Mal performing at Puckett’s but unfortunately, our camera was foggy and had a big ol’ thumbprint right in front. But I’m putting them up anyways… crappy quality and all. Here’s Mal’s performance of You Ain’t Seen Nothing Yet. Let me know if I got the song title wrong. Yes, I know the camera lens is dirty. 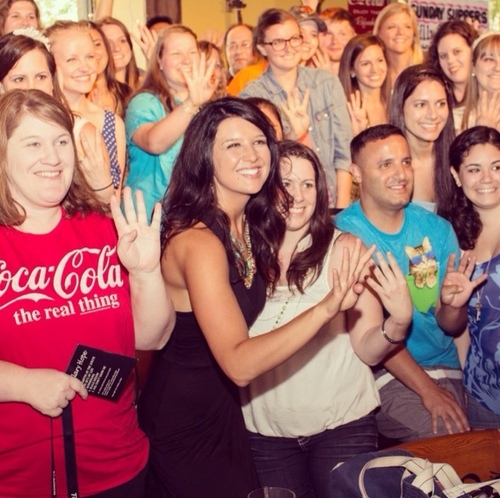 Here’s a pic from the 4th Annual Mallary Hope Fan Club Party at Puckett’s on June 6. 2013. I think you can see a hair of me in the back. June 21: Mallary Hope‘s Birthday. June 22: The Red Tour at Investors Group Field in Winnipeg, Manitoba. On sale now. More information on Ticketmaster.ca. June 25 & 26: The Red Tour at Rexall Place in Edmonton, Alberta. Presale on February 19. More information on Ticketmaster.ca. June 29: The Red Tour at BC Place in Vancouver, B.C. On sale now. More information on Ticketmaster.ca. June 30: The Agency’s David Cook performs with Morgan James at the Montreal Jazz Festival. Previous Previous post: Welcome to The RED Tour, Canada! The Canadian online store gets RED merch!